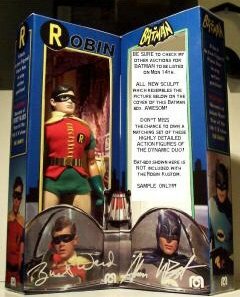 A Highly detailed custom Action Figure, which portrays Burt Ward in his most memorable role as Robin the Boy Wonder, from the hit TV show Batman! This is not a toy, and is for display purposes only. 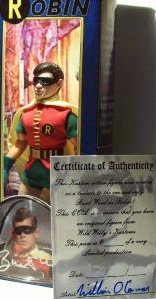 This Robin comes with a real nice COA. Which is, numbered, dated & signed by the artist personally, The COA can be displayed in the window box, or along side of the box. The body used is a Mego Lionrock 7" body which has great joints and is in excellent condition. 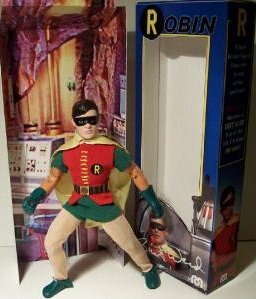 The box says 8" action figure because this Robin was made in proper scale to go along with the 8" Batman custom. The head was sculpted by the artist, and is cast in resin with detailed paint work. 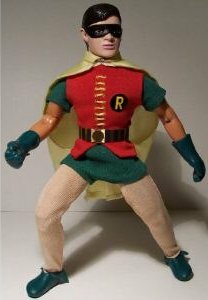 The costume was all custom made using simular materials which were used for the original Burt Ward Costume. The Vest has REAL stitching down the chest and snaps together in the back., The "R" emblem was printed onto high quality vynl and machine cut. The Belt is made from various art materials and has real brass vynl for the buckle and strips. The gloves are nicely detailed and formed from Very durable latex rubber and are molded in green, as are the shoes. The Cape is made from sheer Satin and is lightly sprayed to the correct color of Robin's cape. The Cape is also double layer giving it a satin finish, both on the inside & out. This Cape has been stiffened into this desired position, and looks great the way it hangs from Robin's shoulders. This was indeed a very challenging costume to make, much more difficult and time consuming then Batman's. The box was designed also by the artist and printed using a High definition digital imaging machine onto high gloss Vynl, and then applied onto Bristol board. These boxes are NOT signed by the stars and are in no way under the endorsement of the stars, The names on the boxes have been computer enhanced onto the boxes for display purposes only and are NOT authentic autographs, yet they give the box a "signature series" look to it.